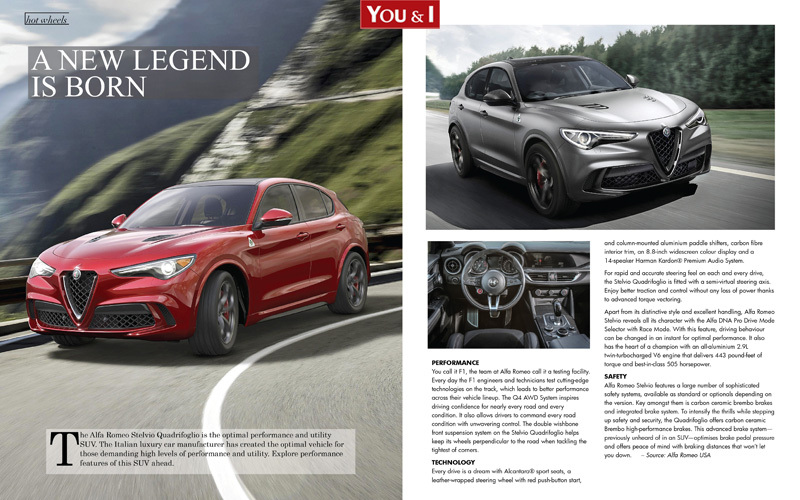 The Alfa Romeo Stelvio Quadrifoglio is the optimal performance and utility SUV. The Italian luxury car manufacturer has created the optimal vehicle for those demanding high levels of performance and utility. Explore performance features of this SUV ahead. You call it F1, the team at Alfa Romeo call it a testing facility. Every day the F1 engineers and technicians test cutting-edge technologies on the track, which leads to better performance across their vehicle lineup. The Q4 AWD System inspires driving confidence for nearly every road and every condition. It also allows drivers to command every road condition with unwavering control. The double wishbone front suspension system on the Stelvio Quadrifoglio helps keep its wheels perpendicular to the road when tackling the tightest of corners. Every drive is a dream with Alcantara® sport seats, a leather-wrapped steering wheel with red push-button start, and column-mounted aluminium paddle shifters, carbon fibre interior trim, an 8.8‑inch widescreen colour display and a 14-speaker Harman Kardon® Premium Audio System. For rapid and accurate steering feel on each and every drive, the Stelvio Quadrifoglio is fitted with a semi-virtual steering axis. Enjoy better traction and control without any loss of power thanks to advanced torque vectoring. Apart from its distinctive style and excellent handling, Alfa Romeo Stelvio reveals all its character with the Alfa DNA Pro Drive Mode Selector with Race Mode. With this feature, driving behaviour can be changed in an instant for optimal performance. It also has the heart of a champion with an all-aluminium 2.9L twin-turbocharged V6 engine that delivers 443 pound-feet of torque and best-in-class 505 horsepower. Alfa Romeo Stelvio features a large number of sophisticated safety systems, available as standard or optionals depending on the version. Key amongst them is carbon ceramic brembo brakes and integrated brake system. To intensify the thrills while stepping up safety and security, the Quadrifoglio offers carbon ceramic Brembo high-performance brakes. This advanced brake system—previously unheard of in an SUV—optimises brake pedal pressure and offers peace of mind with braking distances that won’t let you down.